2018 is the 50th anniversary of the QMU at 22 University Gardens – QMU50 is a project that brings together stories about music spanning half a century. Keep an eye out for snippets of stories over the next week – don’t forge to share your own personal highlight here! Reviews or articles written about Glasgow’s live music scene frequently tag the old Apollo, the Barrowlands and more recently, King Tut’s with such epithets as ‘legendary’. Unfortunately, much less attention has been paid to the role of Glasgow’s various student unions for promoting live music, especially through the 1970s to the 1990s. Foremost amongst the student union venues across this whole time period was the QMU. While I have attended many gigs in these other venues (including the Apollo), some of the most memorable for me have been at the QMU. Though never a member of the Union, as a music fan and a regular gig-goer it was a venue I continued to frequent over many years – certainly from the early 1980s through to the late 1990s and beyond. It served as a mid-sized venue for touring bands before the opening of the Academy and the ABC, and was used consistently for a time by the promoters Regular Music. At the QMU I both indulged and developed my taste for American alternative rock and Americana acts, including Grant Lee Buffalo, Buffalo Tom, Green on Red, Lone Justice and Ryan Adams (to name but a few). Without the QMU I would probably have had to travel much further afield to catch these types of bands. These gigs were always pretty well attended and it was sometimes a jostle to find a spot with a clear view of the stage, but the close-knitted crowd added to the event. There was always the upstairs-seated balcony, but that didn’t afford such a great view of the stage – unless you managed to get a front row seat – so the prime spot was always in the standing space downstairs. As far as I remember there was no proper backstage area and so the musicians going on stage would have to make their way rom upstairs, passing the main entrance, to get into the main hall/stage. If it was an especially ‘packed’ night they would have to push through the crowds that had spilled out into the hallway. While this may have detracted from the performance of more celebrated bands, for bands like Green on Red it brought them and their music all the more closer. Touring bands aside, the QMU also served the local Scottish scene – especially in the 1980s, when it was a regular venue for up and coming bands, some of whom went on to garner wider fame. Wet Wet Wet played there a number of times and I remember seeing them just after they had been signed (for what was said to have been a significant advance in those days). This was not the Wet Wet Wet that would go on to appear/mime of Top of the Pops, but rather a slick and developed live band, replete with a Memphis horn section, playing proper soul music. Whilst in the noughties live music was less of a focus or the Union, I am glad that the venue has made a return to hosting visiting bands again (The Fall being a prime example). I look forward to performing there myself this Friday with the Glam Rock Dialogues, and to another 50 years of live music in the building. Bob has a PhD from UofG on the history of Glasgow’s music scene between 1979 and 2009. 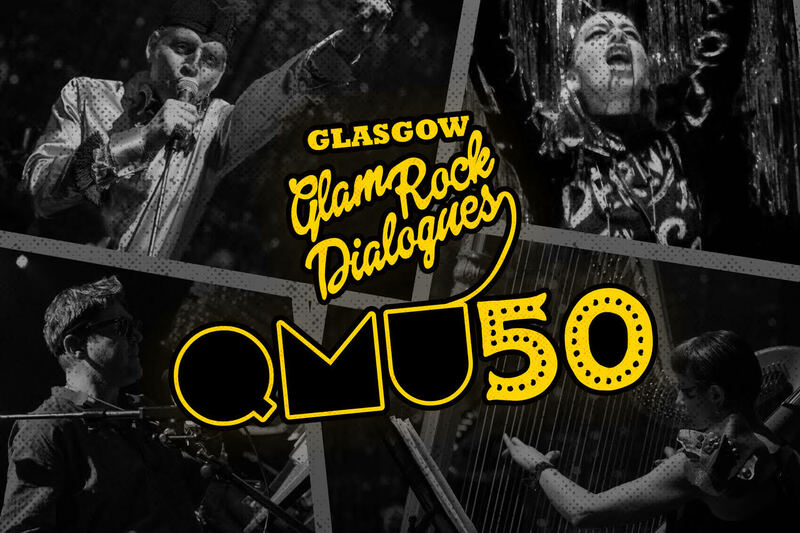 On November 30th he’ll be playing drums as part of ‘Glasgow Glam Rock Dialogues: QMU50’ – a night of images & songs which celebrate half a century of live music at 22 University Gardens.